“The United States has been facing a surge of unaccompanied children arriving from violence-torn Guatemala, El Salvador and Honduras in recent months. Some 90,000 are expected to have arrived over the year by the end of September, according to estimates. Migrants from Central America travel thousands of miles by road and rail through treacherous terrain to reach the U.S.-Mexico border. 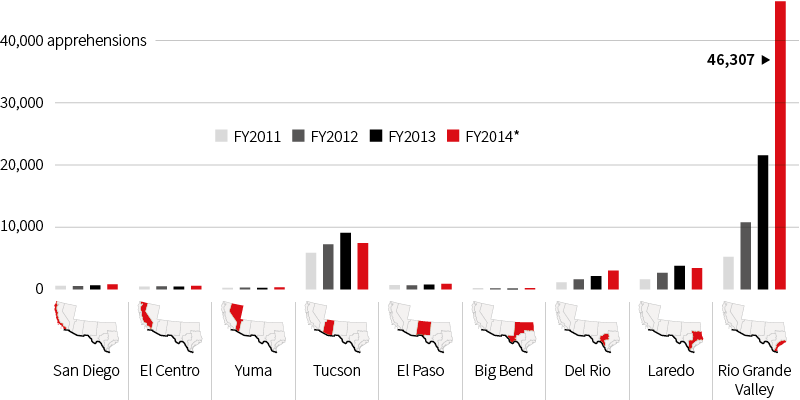 The total number of apprehensions at the U.S.-Mexico border has risen in recent years, especially in the Rio Grande Valley sector in Texas which rose 58 percent from FY2012 to FY2013. The number of unaccompanied minors (aged 0–17) taken into custody in the Rio Grande Valley sector in Texas exceeded 42,000 for the first eight months of FY2014. * FY2014 data through June 30, 2014. 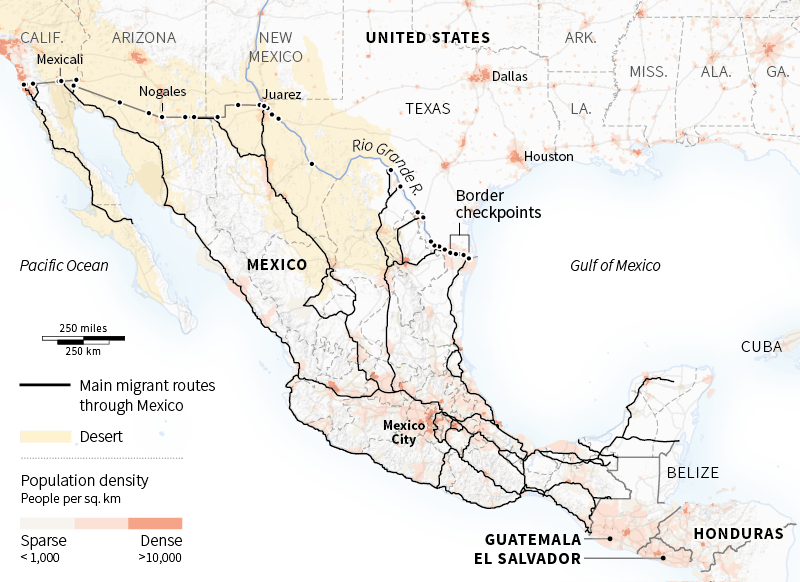 The map shows the number of unaccompanied children apprehended at the U.S.-Mexico border by origin (Guatemala, El Salvador, Honduras) from January 1 to May 14, 2014. Over 2,200 children, the largest number, came from San Pedro Sula, Honduras, the city with the highest murder rate in the world according to latest rankings from Mexico’s Citizen Council for Public Safety and Justice. * Country-wide data for all years except FY2014. FY2014 data through June 30, 2014, reflects apprehensions at the southwest border only. Number of deaths by border patrol sector along the U.S.-Mexico border between FY2000 and FY2013. 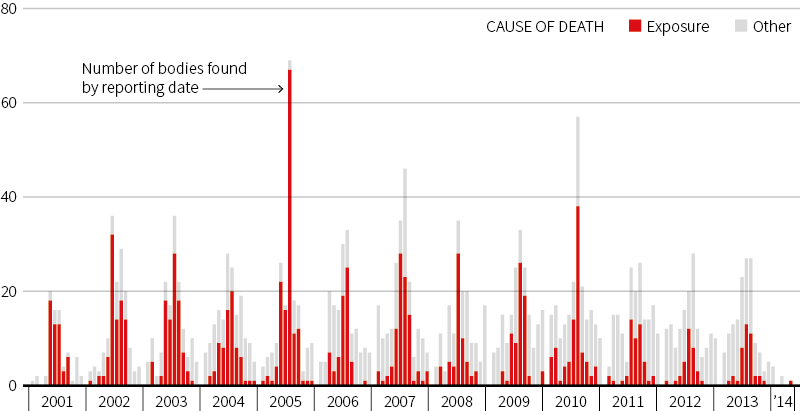 Each red dot represents the body of an illegal migrant, recovered between January 2001 and March 2014. Border deaths have increased as enforcement policies push migrants to cross remote and dangerous terrain to enter the United States. 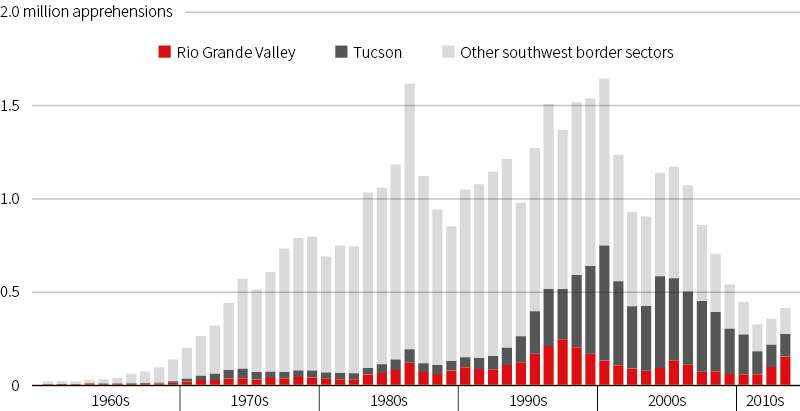 More than 2,100 migrants have died crossing the desert through Pima County, Arizona between January 2001 and March 2014. 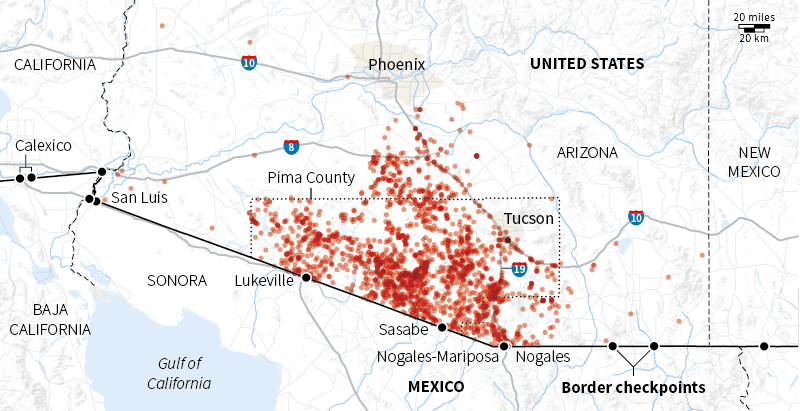 Pima is located within the Tucson border patrol sector and is the only border county that collects geographical data on migrant deaths. Note: U.S. fiscal year runs from October 1 to September 30. Sources: U.S. Customs and Border Protection; U.S. Department of Homeland Security; Office of Refugee Resettlement, U.S. Department of Health and Human Services; Congressional Research Service; SEDAC/CIESIN, Columbia University; Arizona OpenGIS Initiative for Deceased Migrants, Humane Borders; Rodolfo Casillas R.; Consejo Ciudadano para la Seguridad Publica y la Justicia Penal A.C.; Reuters.